*But only if Michael Noonan says he can. JOBS MINISTER RICHARD Bruton wants 3,000 extra startups created in Ireland every year and is planning more tax breaks for new businesses – but only if Michael Noonan’s Budget lets him. In a new entrepreneurship plan, which was launched today, the government said it was aiming for a 25% increase in the number of startups being formed around the country. It also wants a 25% rise in the “survival rate” for new businesses – which has been as low as 48% over the last five years for startups launched in 2007 – to ensure 1,800 more companies kept going each year. The government claims the moves would create an extra 93,000 jobs before the end of the decade. Among the measures set out in the plan are a string of tax moves, including a shakeup of capital-gains tax and income tax – although whether these changes actually happen will be left in the hands of Finance Minister Michael Noonan at Budget time. Jobs Minister Richard Bruton said there would always be a “tax dimension” to building successful entrepreneurs and attracting investment. “That will be a continuous challenge – to ensure that the tax environment we have is competitive and promotes growth in startups and innovation and foreign trading,” he said. The policy included setting new targets for government agencies, including a 12% rise in the startups Enterprise Ireland would support from next year. The organisation invested in 104 startups last year, although its figures also showed the amount it spent for every job it sustained across both new and established businesses was nearly €13,000. Irish Small and Medium Enterprises Association chief executive Mark Fielding said the policy statement was welcome, but without “real changes to the tax system” the jobs target would never be met. “The key target to double the number of jobs from start-ups over the next five years is laudable but will require sustained effort from the government and the delivery of an enterprise-focused budget next week from the Minister for Finance,” he said. Chambers Ireland chief executive Ian Talbot said the country needed to “improve (its) cultural view of entrepreneurs”, who created jobs despite the high pressures and risks involved in starting a business. “They deserve to be supported and encouraged by our taxation system, not penalised by it,” he said. 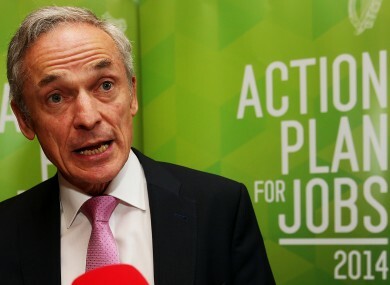 Email “Richard Bruton wants thousands more startups and he might hand out tax breaks to get them*”. Feedback on “Richard Bruton wants thousands more startups and he might hand out tax breaks to get them*”.